Scheme 1.6 Synthesis of (-)-platensimcyn (a) and (+)- and (-)-disparlure (b) from chiral pool chirality can be furnished by the substrate itself or the reagent, stoichiometrically reacting with intramolecular or intermolecular chirality transfer, or by a catalyst that in addition furnishes chirality multiplication with obvious benefits deriving from the small amounts of a natural or man-made chiral catalyst required for the production of large quantities of enantioenriched compounds. In substrate-controlled asymmetric synthesis, a pre-existing chiral group present in the substrate exerts some influence in directing the attack of an achiral reagent on nearby carbons in the molecule leading to an unbalanced mixture of diastereoisomers and the sense of intramolecular induction can be strongly influenced by the substituents in the substrate as well as the reagent properties. Chelation-enforced transfer of chirality is an essential feature in controlling the stereochemical outcome of such asymmetric reactions as it has been demonstrated by the elegant procedure developed by Heathcock  for the preparation all the four possible diastereoisomers deriving from the aldol condensation of aldeydes with (S)-4-trimethylsilyloxy-5,5-dimethyl-3-hexanone, 2. The choice of different bases resulted in the stabilization of Z- or E-geometry of the enolate by stereo-selective chelation and the additional coordination of trimethylsilyloxy substituent with metal directed the alkyl attack on the re-face of enolate. When this three-point coordination was not possible for steric hindrance and/or dipolar reasons the opposite enantiomers are obtained (Scheme 1.7). In a more recent report on the alkylation of fluorinated a-alkoxyesters and glycinates with potassium bis(tri-methylsilyl)amide (KHMDS) as base, the conformational fixing of the enolates through intramolecular potassium-fluorine interactions has been considered crucial for the attainment of good levels of diastereselectivity . The peculiar planar chirality of 1,2-disubstituted ferrocenes can be efficiently generated by applying a diastereoselective metalation-electrophilic quenching sequence on suitable monosubstituted chiral ferrocenes. The presence in such substrates of a heteroatom able to coordinate with lithium and direct the preferential proton abstraction from one of the two possible ortho-positions results in an efficient intramolecular transfer of central chirality to planar one  (Scheme 1.8). In the same way, the intramolecular coupling of two aryl systems joined through a chiral bridge has been exploited for the synthesis of some biaryls with efficient central-to-axial chirality transfer [54, 55] (Scheme 1.9). Scheme 1.9 Atroposelective synthesis of biaryls by intramolecular chirality transfer today available , the Evans' oxazolidinone 3 developed in the first 80s is still very popular for its versatility with a broad range of substrates in different reactions, including enolate alkylation, aldol condensation, conjugate addition and Diel-Alder reaction [61, 62] (Scheme 1.10). The corresponding N-acyloxazolidinones 4 provide selective stabilization of boron enolates in the Z-geometry (Z/E > 100:1) leading to syn- stereochemical outcome, are easily removed by reaction with alkaline hydrogen peroxide to obtain the corresponding acids and have been also applied for the synthesis of macrolides and other natural products [63, 64] with an efficient control of up to 10 stereogenic centers. 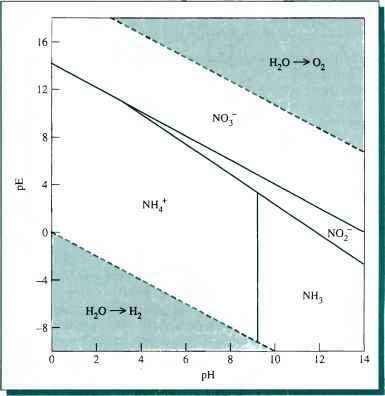 stability to hydrolysis and expanded applicability. Sulphur-containing chiral auxiliaries as Oppolzer's sultam 9 , oxazolidinethiones and thiazolidinethiones 10 , cyclosulfamides 11  and N-sulfinylimines 12 [72-74] have also found application in the stereoselective generation of chiral enolates (Scheme 1.11a). Ellman's sulfinylimines 12b, prepared from readily available aldehydes or ketones and sulfinamides, have proven versatile auxiliaries in the preparation of enantio-pure a-branched and tertiary amines, a- and b-aminoacids derivatives and aminoalcohols through the stereoselective addition of carbon nucleophiles, activated by the electron-withdrawing sulfinyl group, and subsequent cleavage with acids (Scheme 1.11b). , the diallyl Brown's reagent from pinene 15  and the more recent Soderquist's reagent 16  have been preferentially used since they exert increased asymmetric induction due to the lack of heteroatom spacers around the boron center and can be removed under non-oxidative conditions so allowing the recycle of the chiral boron moiety. 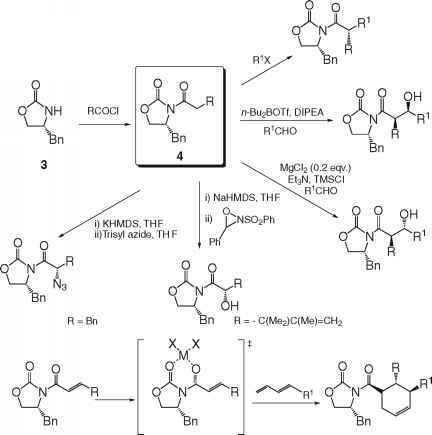 Chiral boron derivatives  have also played a key role in the development of reagent-controlled asymmetric synthesis in which a prochiral substrate is converted into a chiral product under the influence of a chiral reagent able to exert an intermolecular control of the stereochemical outcome of the reaction. 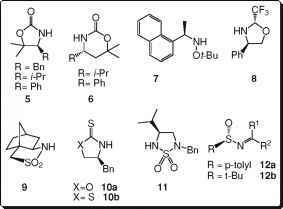 Pinene-derived 17a,  C2-symmetric borolane 18a  and diazaborolidines 19  have been proved effective chiral reagents in a variety of aldol condensations that proceeded with high stereocontrol through the formation of highly stabilized chiral enol borinates as reaction intermediates. Different aldol diaste-reoisomers have been prepared with up to 98% ee by suitable choice of the starting carbonyl substrate and boron ligand (Scheme 1.13). Chiral boron reagents have been also applied in the hydroboration-oxidation of both E- and Z-alkenes [83, 84] to afford the corresponding alcohols in nearly enantiopure form, but moderate levels of asymmetric induction have been reported up to now with 1,1'-disubstituted olefins.